Asphalt paving services large or small lots. 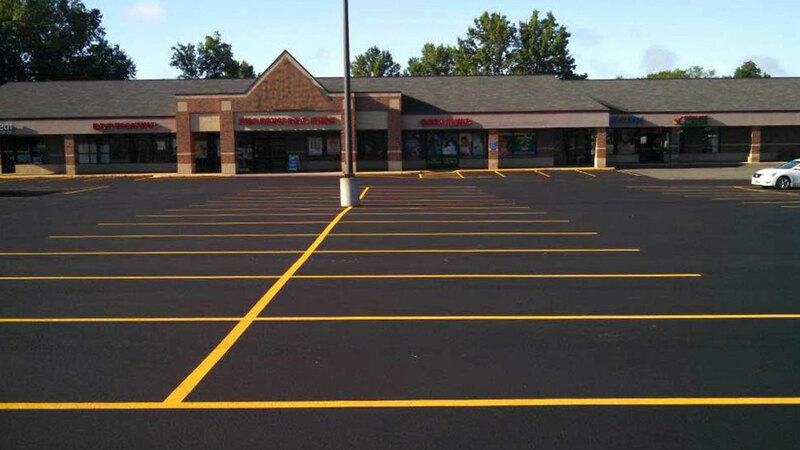 Asphalt pavements has two major weaknesses that lead to its limited life time. The second is a weakness of resistance to salts, chemicals and petroleum products. Asphalt pavements are simple combination of rocks, sand and a glue which is the liquid asphalt that binds everything together. The UV radiation breaks down the asphalt glue and weakens so that it can no longer hold rocks and sand, thus gradually loosing the top surface. The first is the obvious sign of the degradation is the gradual change in color of the asphalt from black to brown, and finally gray. Next your parking lot begins to look rough and piles of sand seem to appear in the low areas of the parking lot. This is not from the neighbors lot but from the deterioration of your lot. In the later stages of degradation the bigger rocks fall out, raveling takes place, and the parking lot is rough, extremely dirty because now dirt and grass fill the spaces where rocks were. Also because the asphalt is oxidizing under the UV radiation, it looses its flexibility. This flexibility is extremely important because asphalt can take great loads and bounce back to its original condition. As asphalt looses its flexibility it becomes brittle and begins to crack and break.